Thanks to hurricane rains many farmers that seeded annuals have a nice crop. 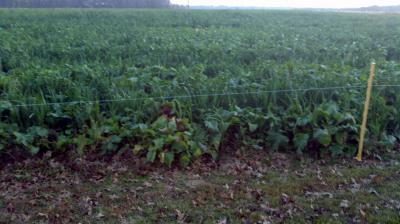 Many fields have great stands and are bound to have above average tonnage. Some things I would consider if I was turned out on these forages are Dry Matter Intake (DMI) and excess protein problems. DMI always becomes a concern on lush, "washy" forages. Because these plants are lush they contain a high percentage of water. Data gathered at the University of Illinois supports a concern that rumen fill stops a cow from consuming her DM requirement on high moisture feeds. For example, an average milking 1400 pound cow that is in mid-gestation needs to consume 27 lbs of DM of feed that is 50% TDN and 7% CP (I feel it is fair to compare this to poor grass hay) to meet NRC requirements. Thus, she needs to eat 20 lbs. of DM of annuals that are 69% TDN to meet energy requirements. There will be plenty of protein. Now, If the forage is lush (~20% moisture) she barely makes her energy requirement (because our data shows rumen fill stops cows around 100 lbs as-is intake). My point is that many of us see all of that green forage that our cows are belly deep in and say "they will get hog fat on that stuff." Then when you bring cows in and they didn't gain any weight you are scratching your head. So, if a 1400 lb. average milking, mid-gestating female barely meets energy requirement... then a lot of the cows in Illinois that weigh far over 1400 pounds and those cows that are close to calve (early Jan calvers), are not meeting their energy requirement. Now, another potential warning is that if protein levels are high, don't stand behind them. But seriously, excess protein will increase passage rate and valuable nutrients will be running out the back door...literally and figuratively. Excess protein in these forages can also increase Blood Urea Nitrogen (BUN) levels. High BUN has been shown to negatively impact conception rates... so if you have fall-calvers out on these annuals, be aware that these protien levels could discourage cows from re-breeding. So with the combination of excess protein and low DM, it makes sense to correct that by offering some poor quality forages like cornstalks or poor grass hay. Cattle may not consume a large amount of these feeds, but a little will go a long way to get DMI up and slow the passage rate down.